The paint pouring technique is easy to master, but sometimes selecting the best colours for vibrant, stunning results can be a challenge. DecoArt has meticulously searched through dozens of colour combinations to introduce Americana Multi-Surface Acrylic Paint Pouring Packs. These colour palettes were extensively tested to ensure beautiful paint pours. Specially curated to showcase today’s hottest trends, these acrylic packs are the perfect tool to start pouring today! Each pack contains four 59ml (2oz) flip top bottles of acrylic paint. 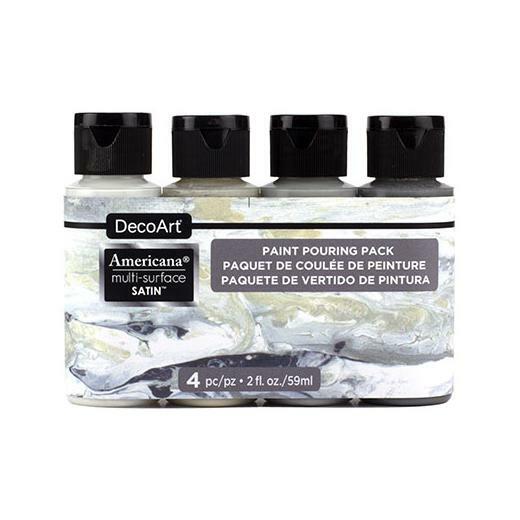 You will also need DecoArt Paint Pouring Medium which is available separately.